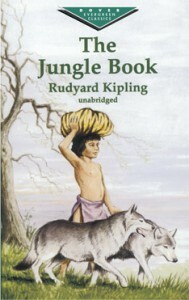 The Jungle Book by Rudyard Kipling - Ungh... Arrr... Books! GPS Blog Read #2: Below are my ratings, under that an explanation on why I rated them as I did. Overall, there was just too much boredom or hate and not enough escapism. I found the writing to be pretty terrible. I didn't feel any connection to the characters, the tale was disjointed and the ending was meh. I guess this is what happens when you skip all the middle and just highlight the important events. I couldn't bring myself to care or look closer at the societal themes. I tried reading aloud, and then even way out loud... nothing helped to improve this one. 2 stars for a decent introduction to the setting and cast of characters. "The Jungle People put them (the Monkey People) out of their mouths and out of their minds. They (the Monkey People) are very many, evil, dirty, shameless, and they desire, if they have any fixed desire, to be noticed by the Jungle People. But we do not notice them even when they throw nuts and filth on our heads." "We are great. We are free. We are wonderful. We are the most wonderful people in all the jungle! We all say so, and so it must be true," they shouted. "Ahae! My heart is heavy with the things that I do not understand." LMFAO at this translation. More like.... very boring! And depressing! I don't even... this story was probably the worst of them all. I just felt disgusted by the end. BLEH! I met my mates in the morning, a broken, scattered band. Men shoot us in the water and club us on the land; Men drive us to the Salt House like silly sheep and tame, And still we sing Lukannon—before the sealers came. The best story out of the bunch. Not much to say on it except that it was a fun ride through the life of the mighty mongoose. Eh, this started off slow and then it was okay and then boring. After reading all the animal tales, a story that followed a human wasn't all that captivating. This story had animals conversing that belonged to a military camp... mules, horses, camels, etc. Didn't really hold my interest. For a movie that has so many known actors, this movie sucked. The acting was horrible, the script was horrible. It's nearing 3am and this would have just been a rant anyway.... so yeah, if you value your time, just skip this movie.